Fonds F0022 - Marie Jakober fonds. 5.41 m of textual records. Canadian author. Born on a homestead farm near Fairview, Alta., M. Jakober obtained her early education through correspondence courses, later attending high school in Edmonton and graduating from Carleton University. Her published work includes eight novels, poetry and short stories published in Canada and abroad. At age twelve, the author won her first award, a prize for poetry in the International Children's Competition, winning the gold medal in the same competition the following year. A third-place finisher for her novel The mind gods in the 1974 Search-For-A-New-Novelist Competition, M. Jakober won the George Bugnet Award for Fiction (Novel) for Sandinista in 1985 and for Sons of Liberty in 2005, and the Michael Shaara Award for Excellence in Civil War Fiction for Only Call Us Faithful in 2002. Acquired between 1987 and 2008. 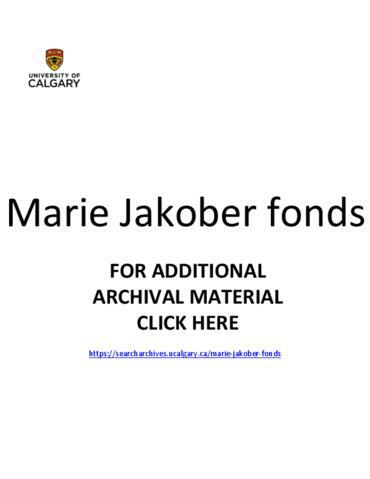 Fonds consists of correspondence, manuscripts of novels, short stories, addresses to various organizations and conferences, and essays written by M. Jakober as a university student; published poetry and short stories; and other miscellaneous material. File level inventory available at repository.